By “how to connect properly” I mean legally, and without damaging the environment. There is a big problem with washing machines and dishwashers being connected to the wrong drainage systems which is polluting our rivers and streams. This is part 3 of my articles on the subject containing diagrams, pictures and a video. It may make more sense to read part 1 and part 2 first. 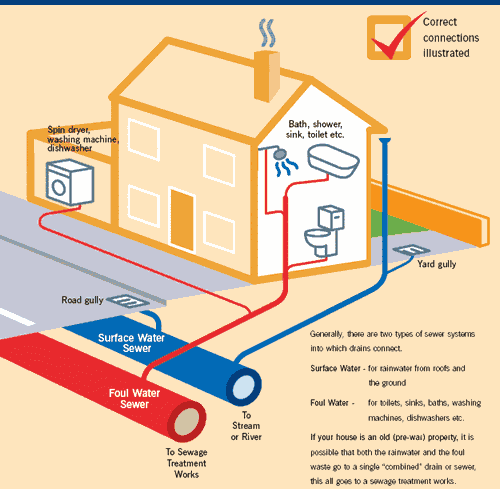 In the diagram above, the house on the left has all plumbing connected correctly. Water from gutters (shown in blue) runs through the storm drain system and into rivers. 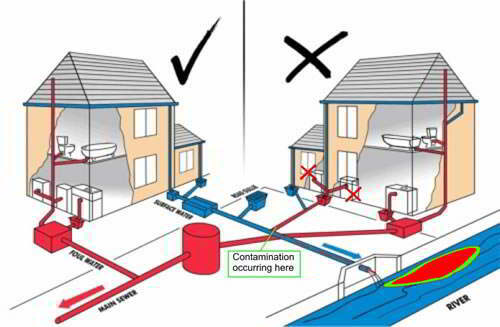 The waste water from toilet, bath, sinks and appliances (shown in red) runs into the sewerage system. The house next door on the right is misconnected because two appliances are draining into the same drain that the water from the guttering runs into (marked with red crosses). 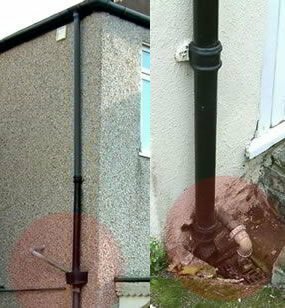 The house on the left has an appliance or sink waste pipe coming out of the wall upstairs and tapping into the clean rainwater drain pipe for the guttering. The right side of the picture shows the same thing which has happened to a connection downstairs. Most probably a washing machine has been plumbed in and conveniently used the nearest but wrong drain system. Part 1: Is your washing machine or dishwasher misconnected? After reading the comments above I have a question. I have a situation were I am not connected to the sewer system instead I have a cess pit and soak away. I have read that it is not a good idea to run washing machine waste into these tanks. What is the solution a totally separate sealed tank ?